Press conference concerning the Soviet Union's decision to end the unilateral moratorium on nuclear testing it began on August 6, 1985. In a statement, Deputy Minister for Foreign Affairs of the USSR, Vladimir Petrovsky, announced that the Soviet Union will resume testing in 1987 if the U.S. conducts another nuclear test, and called for further negotiations. 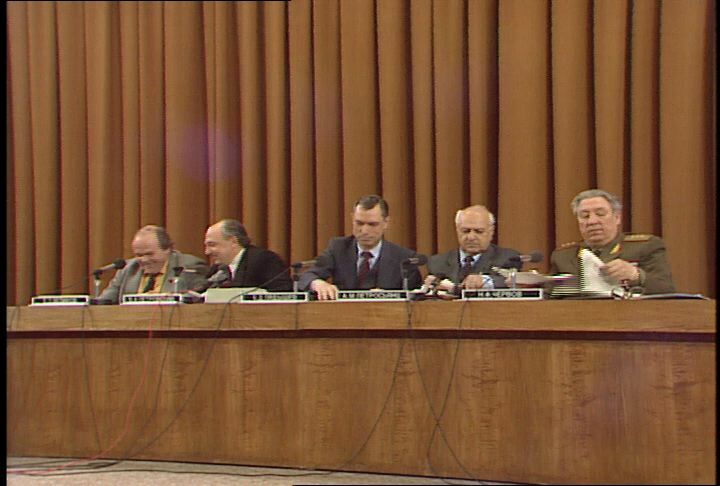 The panel also included Chairman for the State Committee for the Utilization of Atomic Energy of the Soviet Union, Andranik Petrosyants; Vice President of the National Academy of Sciences of the USSR, Evgeny Velikhov; and Chief of Directorate General Staff of the Armed Forces of the USSR, Col. Gen. Nikolai F. Chervov. Petrovsky's statement is followed by questions addressed to the panel. Also discussed is the decision to allow nuclear physicist and dissident Andrei Sakharov to return to Moscow after six years of internal exile in Gorky, and the pardoning of his wife, human rights activist Yelena Bonner. Questions and answers are mainly in Russian with simultaneous translation in English. Chicago: “War and Peace in the Nuclear Age; Soviet Union to Resume Nuclear Testing,” 12/19/1986, WGBH Media Library & Archives, accessed April 26, 2019, http://openvault.wgbh.org/catalog/V_A6738126F5D54209862A97C48B248AD0. MLA: “War and Peace in the Nuclear Age; Soviet Union to Resume Nuclear Testing.” 12/19/1986. WGBH Media Library & Archives. Web. April 26, 2019. <http://openvault.wgbh.org/catalog/V_A6738126F5D54209862A97C48B248AD0>.